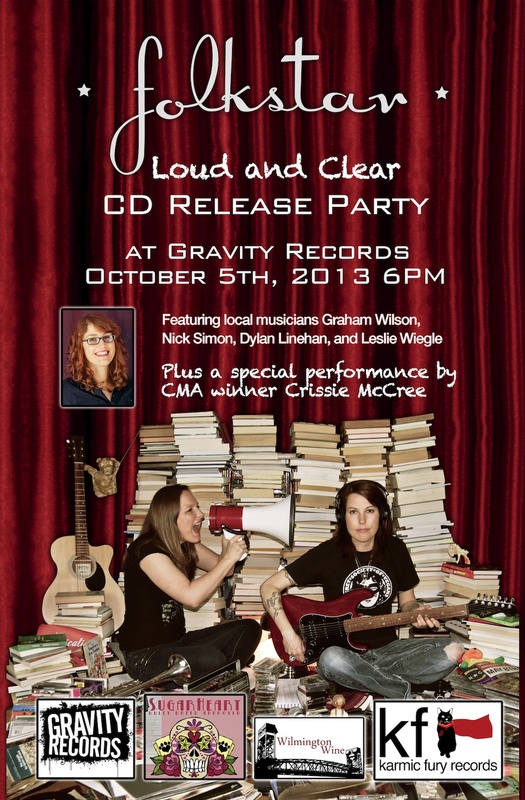 On October 5th, Karmic Fury Records artist Folkstar will celebrate the release of their newest album Loud and Clear at Gravity Records in Wilmington, NC. Folkstar will perform with a full band featuring local musicians Graham Wilson, Nick Simon, Dylan Linehan, and Leslie Wiegle. The event will also feature a special performance by local musician and CMA winner Crissie McCree. Gravity Records is a local landmark and the hub of local musicians and music lovers. The Folkstar CD Release Celebration will double as a celebration of local music and local businesses. Our favorite local libations shop Wilmington Wine will be on site with wine and beer, including a selection of local brews. Jacksonville pitbull charity Sugarheart Foundation will also be participating. Sound will be provided by local audio engineers Karen Kane and Nyla Cione. ← New Folkstar Album Loud and Clear is Now Available!